Rosie, a three-year-old pit bull who spent much of her life at a Nebraska animal shelter, had to overcome hurdles most other dogs don't face when waiting for a forever home. Though it might've seemed at first that Rosie was simply obstinate, staff members at the Aurora Humane Society learned through trial and error that the dog wasn't actually difficult -- she was deaf, and needed time, patience and understanding to communicate. "We started using treats and putting the treat up to your face and saying ‘good girl' with your thumb up and then she figured out how, that we were communicating with her," shelter volunteer Tracie Pfeifle said of her efforts to teach Rosie sign language, as reported by a local CNN affiliate. "It was just amazing to watch her just blossom into a dog. I don't think she knew how to be a dog." Rosie's ability to understand sign language hasn't simply helped her communicate with shelter volunteers -- it's also helped her find a home. 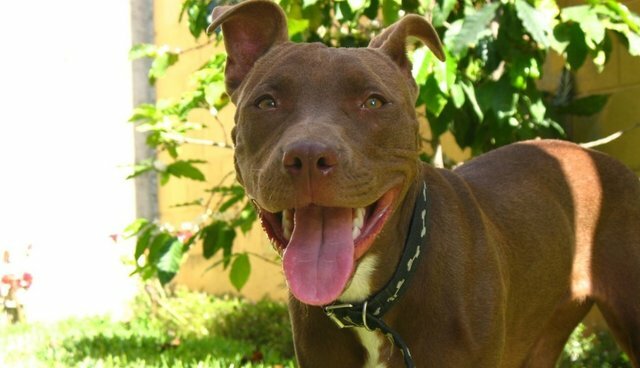 Cindy Koch, Rosie's new owner, was drawn to the pit bull precisely because she is deaf. "I'm deaf," Koch explained, "and we want to relate to her and understand how she feels, want to communicate with her through signing, teach her signing." Each of Koch's family members already signs as well, and they look forward to teaching Rosie the same ASL they use at home. Pfeifle believes the family will be a great fit for her favored dog. "It's what I hoped would eventually happen," she said. "[Rosie] couldn't have gone to a nicer family."